Type 2 diabetes mellitus, which is usually a result of wrong dietary habits and reduced physical activity, represents 85-95% of all diabetes cases and among other diet related diseases is the major cause of deaths. The disease is characterized mainly by hyperglycemia, which is associated with attenuated insulin sensitivity or beta cells dysfunction caused by multiple stimuli, including oxidative stress and loss of insulin secretion. 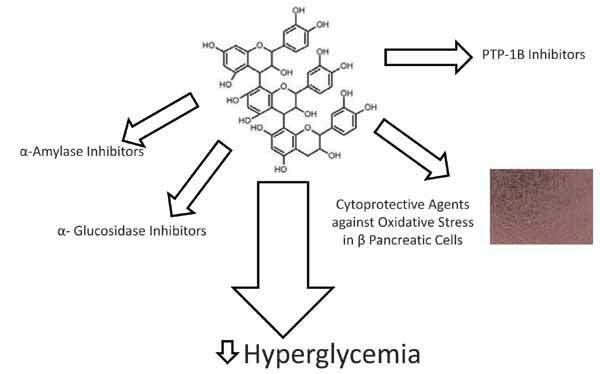 Since polyphenols possess multiple biological activities and constitute an important part of the human diet, they have recently emerged as critical phytochemicals in type 2 diabetes prevention and treatment. Their hypoglycemic action results from their antioxidative effect involved in recovering of altered antioxidant defenses and restoring insulin secreting machinery in pancreatic cells, or abilities to inhibit the activity of carbohydrates hydrolyzing enzymes (α-amylase and α-glucosidase) or protein tyrosine phosphatase 1B (PTP1B), which is known as the major negative regulator in insulin signaling. This study investigates the total phenolic content (Folin−Ciocalteu and HPLC methods) and antioxidant capacity (ABTS) of 20 polyphenolic extracts obtained from selected edible plants, which were screened in terms of α -amylase, α - glucosidase and protein tyrosine phosphatase 1B inhibitors or protective agents against oxidative stress induced by tertbutylhydroperoxide (t-BOOH) in βTC3 pancreatic beta cells used as a model target for antidiabetes drugs. The study concludes that Chaenomeles japonica, Oenothera paradoxa and Viburnum opulus may be promising natural sources for active compounds with antidiabetic properties. α-amylase, α-glucosidase, βTC3 insulinoma, Cytoprotection, Type 2 diabetes, Polyphenols, Protein tyrosine phosphatase 1B (PTP1B). Faculty of Biotechnology and Food Sciences, Institute of Technical Biochemistry, Lodz University of Technology, Stefanowskiego 4/10, 90-924 Lodz, Poland.